Hey guys! I hope your week is off to a great start! I have a new soup recipe for you today. Over the last few weeks, I’ve been trying out the different sausages from Teton Waters Ranch. I have loved all of their products that I’ve tried so far. I am so glad that our local Natural Grocers started carrying their products! The beef that they sell is 100% grass-fed. 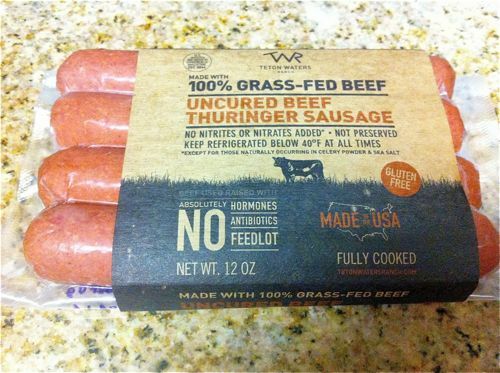 Here’s a little info on why you should choose grass-fed beef when possible. This week’s recipe features their Thuringer sausage. A smoked and veg-cured (no nitrites or nitrates) sausage with the flavor of a bratwurst but the bite of a frank. A true German sausage. 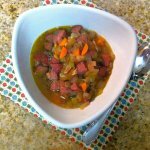 I used the TruRoots brand of sprouted green lentils again in this soup recipe to save time and effort. You can always sprout your own, if you are feeling all Martha Stewart-like. Here’s a great tutorial on how to sprout lentils. The Bragg Sprinkle seasoning that I’ve used is a blend of 24 organic spices and herbs. The apple cider vinegar might sound a little weird, but it really works in this soup recipe. I forget what chef said it, but he said that if a dish seems to be missing something, it usually needs some kind of acid like citrus or vinegar. 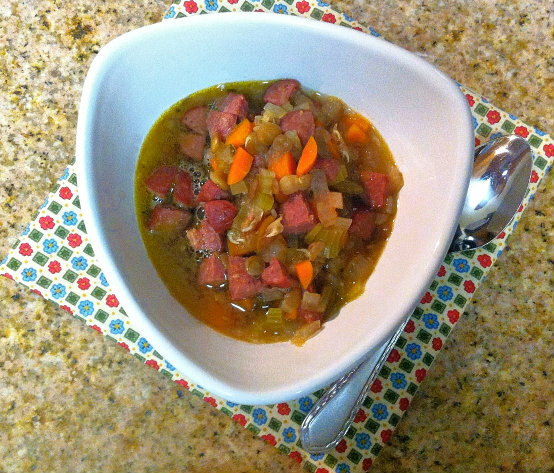 I thought that the apple cider vinegar would pair well with the Thuringer sausage, and it was the perfect complement to this soup! Fall is quickly approaching, and it’s always great to have some soup recipes on hand to make in the chilly months of the year. This soup is very filling, healthy and will warm you right up! In a large soup pot, heat oil over medium heat. Add the onions, celery and carrots, cook until onion is translucent and vegetables begin to soften, stirring often, 7 to 8 minutes. Add the garlic and Bragg Sprinkle seasoning and cook for about 30 more seconds. Pour in the beef broth and water, then add the lentils and sausage. Bring to a boil, reduce heat and let simmer until lentils and vegetables are tender, about 20-30 minutes. Stir in the apple cider vinegar. Check seasonings and add salt to taste.